WHY ARE ER™ 2400 CALORIE EMERGENCY FOOD BARS THE BEST CHOICE? Each 18-oz. survival food bar packet contains 6 individual 410 calorie emergency food rations, for a total of 2,460 calories (10,299 kj.). Recommended consumption is 2 rations per day/person. Up to 5-year shelf life certified by the U.S. Coast Guard. Withstands extreme conditions and temperatures (-22°F to 149°F, -6°C to 65°C). Non-thirst provoking formula – no water required for consumption. Bars crumble easily and may be mixed with water to form a paste for younger children or adults with dental issues. Formulated with an optimal Balance of nutrients - Enriched with FDA recommended vitamins & minerals. No trans fats, cholesterol, coconut or nuts. 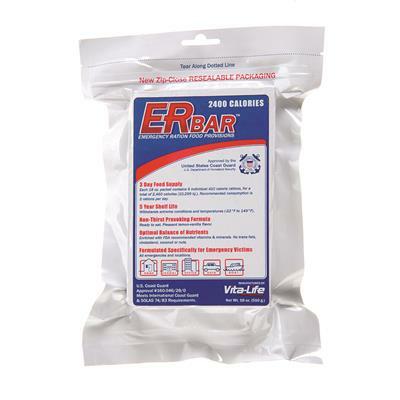 ER™ Bars contain no cholesterol, coconut, or nuts which may cause dangerous allergic reactions when medical aid is scarce. U.S. Coast Guard approved hermetic sealing process utilizes corrosion-resistant material that meets the MIL-131 Barrier Materials Standards ensuring the freshness of your food supply for up to 5 years. Unlike many "Meals-Ready-to-Eat" (MREs), ER™ Bars do not require water and take up less storage space. Packaging features a re-sealable pouch to help maintain freshness. Dimensions: Single (1): 7.75 x 4.75 x 1.25" - Case (20): 12.75 x 9.63 x 6.63" - Pallet (1,800): 40 x 48 x 48"
Instructions: Recommended consumption is 2 of the 6 included pre-measured rations per day. ER™ 2400 Calorie Emergency Food Bars provide disaster victims with a 72-hour food supply. Formulated with a unique non-thirst provoking formula, ER™ Food Bars contain 100% of the daily recommended values of vitamins and minerals and delivers a perfect blend of calories and nutrients to maintain energy levels. ER™ Food Bars are certified by the U.S. Coast Guard to remain fresh for up to 5 years. The packaging of the food bars ensures they can withstand extreme temperature fluctuations allowing them to be stored outside or inside vehicles. Each food bar is scored into 6 individual rations and packaged in a re-sealable pouch. Minimal consumption is 2 rations per day for a total food supply of 3 days.